Have you ever needed to upload photos and videos to Instagram from a computer? While Instagram is primarily a mobile site, they do allow you to access an Instagram feed where you can view, like, comment, and embed an Instagram photo in a blog or website. But what if you want to upload photos to Instagram from your computer? Right now, Instagram does not offer this feature. Instead, you can use a third-party tool to upload photos and videos to Instagram from a computer. What types of media can you upload to Instagram? You can upload photos and videos to Instagram and even use Instagram Direct to share private content. To upload your photos and videos to Instagram, follow the instructions below. Here is a video tutorial that walks you through how to setup Bluestacks so that you can upload photos to Instagram from your computer. 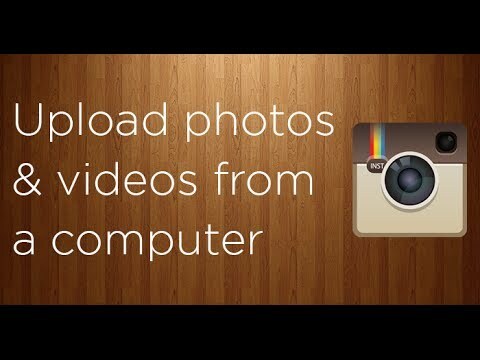 Upload photos and videos to Instagram from a computer with the help of Bluestacks. Uploading photos to Instagram from a computer using Bluestacks. Note: In Instagram settings, uncheck use Instagram’s advanced camera. If you don’t uncheck this option before pressing the camera icon, Instagram will try to use your computers webcam. Although Instagram does not offer the ability to upload photos to Instagram from a computer, I find Bluestacks works great! While I love taking photos from my iPhone, sometimes I use a DSLR and I want to be able to share those photos on Instagram as well. If you are a Photoshop user, you will also appreciate being able to edit your photos beforehand. By using this method to upload photos and even videos to Instagram from a computer, you get the best of both world’s. This way you can create something that adds value to for your Instagram followers. Just because Instagram lacks a desktop version, Bluestacks has created a nice solution to let you upload all of those photos you have stored on your hard drive to your Instagram account. Overall, I was impressed with how easy the setup process was and like that you can now create pictures and videos from different cameras and use them on Instagram. What do you think about this way of uploading photos and videos to Instagram from your computer? Would you rather stick to just using your mobile device or do you like having the ability to choose between a phone or tablet or computer? Great tip and very useful for companies who may have several people creating content. @AntonioCalero:disqus one other thing I like about this is that I can run other apps – not just Instagram. Very handy for testing different apps on different devices. Hi there, I installed BlueStacks on my Mac, and it’s not “finding” Instagram nor ES File Explorer. Actually, the App Finder isn’t finding anything. Are you using Windows or Mac? @lutang:disqus if you don’t see them in the search, try clicking on Top Charts and then select an app. It will ask you if you want to install it. Select “install here” and it will take you off to the Google Play store where you should be able to add Instagram and ES File Explorer. I got it to come up, I just restarted the application. Unfortunately now, Instagram is sideways. This is such a pain. I had to create a Google Play account and now everything is sideways. lol. Is there no other way to do this from my Mac other than this BlueStacks thing? @lutang:disqus, surprised you are having issues. I’m running it on a Mac on Mavericks and have had any issues. Happy to compare my setup. Try using 640×640 for the resolution and .mov for the filetype. I have successfully converted my video to .mov. What app/software do you suggest I use to change it to 640 x 640. Sorry. Not really tech-savvy. Thank you for the help. I appreciate it very much. After I make the file 640 x 640 and .mov, I use handbrake on it? I have used handbrake only once before. Will try that. Thank you for your help. Hi, Christian. I used handbrake on my 640 x 640 .mov file. Is that right? I tried uploading it and got the same error. Sorry for being a pain. I can’t figure out what’s wrong with it. Thanks for your help. For the video size and filetype, yes. When you are trying to upload the video, how are you trying to upload it? Through Bluestacks? Or another way? Hi, Christian. We have been able to upload a video but the cover frame is inverted (rest of the video is ok). Can you please let me know what we can do so it does not show up upside down? thank you. As far as how to fix this, I would recommend re-recording the video. Save it as a different type such as m4v or mov. what a version of instagram u use? I actually had to ask my teenager how to do this as my clients wanted to add Instagram to their social media portfolios, but thank you because now I can use your video to teach them how to do this themselves. @f_a_i_t_h:disqus please post your comment here: http://www.christiankonline.com/contact-instagram Thanks! Try using a size of 640×640 and .mov format. @sodmind:disqus, what size and filetype is your video? Try 640×640 and .mov. Anytime. I think Bluestacks does a good job at letting you upload photos from a PC or Mac to Instagram from your computer. Thanks for sharing. Actually I need this in the meantime 😛 What happens if I want to use my IG accnt on my phone and I have this app also on my laptop? Nothing. You can use both. They feed into your account. Installed and uni stalled couple of times. Can you try clicking on another app from Bluestacks? Find one that takes you to the Google Play Store. Once you get this, it should add those apps back to your Bluestacks account. I can’t see any option to upload a video, please help, i only downloaded bluestack to upload video from my computer but there is no option to upload video except images. Whats the solution? When creating your content, make sure you use 640×640 and make it a .mov file. Video editing can be tricky. Was this a video converted from another source? @matthoefler:disqus, what size is your video? Also, what filetype? It needs to be 640×640 and MOV. Also, did you try checking the advanced option – for use with only videos? This method flat out doesn’t work… are you actually consistently uploading videos using this method, or do you just think that it works because you maybe did it once? Matt Hoefler, I’ve done it numerous times. I’ve also heard from others that they have had no issues getting it work either – once they got their format correct. What isn’t working you exactly? Are you getting an error message? Is that program just not loading? And what type of computer are you trying to upload it from? If it’s Bluestacks, then that could indicate an issue with your machine and not having enough memory or meeting the requirements of the software. I suspect the issue is your original video source – video encoding is tricky to work with. One other thing you can do to test this is to add your file to Dropbox and then save it directly to your phone and upload it to Instagram from there. I’ve had a few people tell me that identified an issue with their video source – the video would rotate or wouldn’t simply wouldn’t upload. Bluestack does not appear to work on my Mac running 10.9.4. Don’t see any APPs, no search, none of the icons work. I can’t even send a meesage to Bliuestauck (it freezes). @wvitomontone:disqus, I run Bluestacks on a Mac running 10.9.4 and it works without any issues. If you’re not seeing any apps, I would try closing and restarting your computer and possibly reinstall the software. It sounds like something didn’t get installed properly. Are you using Android to upload to Instagram when you get this error? Definitely, I CAN’T upload videos with BlueStacks. As you say, I have converted my video to .MOV and 640 X 638 (very similar to Instagram size) but it’s impossible. Did you try restarting the software and your computer? It should work. I use Windows 7 computer… And any problem with it. When I want to upload photos, Instagram in Bluestacks runs well (I have posted some photos perfectly). But when I try with any video, I open “bstfolder”, “pictures” (my video is there, in “pictures”), I click on it… And the principal screen of Instagram appears again with a message like “media unsuportted”. Also, I have tried the “Instashot” App. I select “Pick a video”, the video appears and runs (It runs perfectly!!!) but then I click on Instagram icon to share it and I must choose one of the 3 options of resolution. I choose one of them and… The Instashot App closes itself and the Bluestacks screen appears again…. THANKS A LOT for your help and congrats for this page (very complete and clear). And sorry if my English level is not perfect. Greetings, Christian! Just because you download a file from your channel doesn’t mean it’s compatible. There is info in the file that can corrupt the file and cause it to not work. Also, Instagram may have something they add to the file when people download it (or how they are downloading them). I keep recommending to reach out to Bluestacks because this is a subjective issue. For every one that is on Windows who gets it to work, there are others for which it’s doesn’t work for. Seems like it may be tied to the individuals system – hardware and programs they have installed. Videos need to be in the format that they support. This includes the size as well as the same type of file. Video can be tricky to work with if you’re encoding it from one format to another. It only recognize image, not working with videos. Is it still working for you guys? You should be able to upload videos to Instagram from a computer as well. What filetype are you using? Also make sure you turn back on the advanced setting for video. What’s up Christian? Been a while – hope you are well. I came across your post completely but chance – but it was what I was looking for. However, I can’t seem to find BlueStacks for the Mac any longer – the developer has changed their site and available products. Unless I’m overlooking it, appears that they only offer a PC version now for download? Do you have another solution or know where I could download an old copy of the app for my Mac? @disqus_15SjUyXOxg:disqus, great seeing you again! I saw that change too. You can get it here: http://bluestacks-app-player-mac.en.softonic.com/mac. The download seems to still work. Get an “unable to upload” error when I try to upload a 15 second video. Hi. I can’t find the “bstfolder” in ES File Explorer. I’ve uninstalled and reinstalled Bluestacks twice. There doesn’t seem to be a way for me to upload videos from my W7 laptop to Instagram and it’s very frustrating… Any tips? @disqus_nzYgexpmEL:disqus, it should be there. Make sure you also don’t have the folder hidden by accident. I advise you to try smth else.For example .push.photo. It helps you with posting and even with scheduling. And without downloading any app (really hate having millions of apps). I managed to install it and to upload a photo. I cropped it, but it won’t let me edit it. It’s still loading (for like ten minutes already). What do you think might be theproblem? Can you help me? @vlicebella:disqus, I think it’s a resource issue with your computer. Make sure you don’t have a lot of things running that are taking up ram. i can’t upload a video via this method. it just comes up with a pop up saying that the video can’t be shown. Did you disable use advanced camera? What type of file is it you are trying to upload as well? @disqus_Z3ukBoUAQF:disqus, it should work. I used a Mac as well to perform the upload without any issues. Be sure you also uncheck the show advanced camera option. Thanks for this– seemed to work (on Mac) but I did this to get an MP4 (made with AfterEffects) onto Instagram, and upload seemed to start, but after a few seconds the Bluestack Instagram shifted from download screen to its regular screen and it seemed nothing uploaded. Was file too big? (16 MB). Should I have waited longer? I would try a smaller file first. And give it enough time. i hope you know there is no bstfolder. and instagram has blocked third party programs from uploading photos. @grgerggr:disqus, this has always been the case. They are very strict on how third-party tools use their API. I managed to finally install Bluestacks and both Instagram and es file explorer…however that is as far as I get…there are no images anywhere in the file explorer. How do I get images from my laptop into the files explorer to upload? Hi Tammy. You should be able to navigate outside of that folder or locate it on your computer so that you can drop photos into it. Alternatively, I was able to setup a separate folder for pictures that I wanted to upload to Instagram from my computer and access it from within Bluestacks. If you’re still stuck, can you schedule a time with me to help? Note: Use the code: CHRISTIAN72S when scheduling a time with me to get your first helpout session free. My folders in ES FE don’t have the photos I want to use for content. How can I access my drop box, desktop or other files on my hard drive to get access to them? Try copying the files you want to upload to that folder. Alternatively, you should be able to navigate to your other photos. How do I access my external drive which holds all my pictures, content for posting? Or my desktop for that matter..
You should be able to pull it up when you go to upload a photo. cannot get past the sign into Google account. I don’t want to be required to sign into Google. You need to sign-in to Google. That’s needed in order for them to connect you to Google Play – to access the applications you’ll need. How do I download Instagram for my computer (Mac)? Hello, This article is really helpful – it took me some time but I have finally managed to upload photos from my MAC – yay. I am however, having issues with uploading videos….I am not sure what I am doing wrong, I am only uploading a short (test) video about 7 seconds….filetype is .mov but I am given an error msg “unable to upload image”. Thanks in advance for any tips! I can choose image from the bstsharefolder and the image is loaded in crop section of instagram . but after i proceed , the image is not loading and a continues sing of loading is coming ,and nothing is happening and I have to restart instagram.. Thanks for reaching out. I’m not sure why you’re having an issue loading images. I think it’s an issue with something on your machine conflicting. I would try to reach out to the Bluestacks support team here: http://support.bluestacks.com/hc/en-us. They can better diagnose the issue based on your setup. There does not seem to be a Mac version of Blue Stacks anymore. Am I doing something wrong? I would go off of those. @disqus_c9HBAYj0vO:disqus, I would use Handbrake. You should be able to select your file and then under the output settings, select the format you want and click the start button. @pavlinapopova:disqus, have you tried disabling the advanced video option? Yes there is. Just be sure you’ve disabled the advanced video option. Otherwise it won’t let you. Hi there , thx for the tutorial, i installed ES file explorer and instagram… but i dont have a bst folder ???? how can i get my already edited pics into the ES file explorer? do i need to upload it ? i can choose from my pics on my harddrive. btw i am using MAC if that helps! would be great to get some advise. ahhh when i open the ES file explorer i only see a couple of other folders like alarms, android, backups. DCIM. movies, picstures and so on … all of them are empty. i can drop pictures in one of the folders though ???? Try restarting. What version operating system are you using on your Mac? Winnie Skupin, have you tried reaching out to Bluestacks support? They stopped supporting their software on Mac. When are you getting that error? At what point in the process? I cant find the advanced features in instagram settings. same problem any help here? @disqus_kejWKAerVx:disqus, they do update the Instagram app (and API requirements) from time-to-time. Are you using an iOS or Android device? I have the same problem and I’m using a Macbook with Yosemite. The camera on my laptop is enabled and there’s no advanced setting anywhere in the options when using Instagram on Blue Stacks. Is there an solution to this or am I just SOL and have to leave the camera on. Are you using the PC or Mac version @disqus_kejWKAerVx:disqus? Under Settings there isn’t an advanced camera settings to check or un-check. There’s no advanced settings period. What now? I’m having the same issues. Did anyone find a resolution to this??? where do i even get to the settings? Settings for which application? Bluestacks or Instagram? Have you tried restarting Instagram, Bluestacks, as well as your computer? what a version of instagram u used? You helped me set up instagram for desktop the first time. I took my computer for repair and they wiped it off. I can’t get it working on my desktop again. I now have windows 10. When I try to down load the ES file explorer, I get starnge things. If I go to the 3 dots on instagram, there is no choice of the “use instagram camera” to choose from. I have been trying to add this back for months, and I give up. Can you help? Thanks Christian. I’m not sure if it’s a Windows 10 thing or Instagram issue. I would try reaching out to Bluestacks support. See if they have had other questions about it. Then let me know how you make out. Anytime @violettesbybecky:disqus! Let me know how things work out for you. I wrote to them. They said they got my question, but still have not answered. I can not seem to find a version of es explorer that will download onto my PC. Can you recommend a link? Okay, sorry, this isn’t working on my Mac. ES File Explorer keeps wanting to go to my Android (tablet) connection,… I cannot find a way to connect to any photo files on my Mac. My desktop camera keeps coming on (there is no 3-dot settings icon in the upper right corner) so I’ve selected ‘Gallery’ to find photos… but that tells me there is no media,… what a mess. I’m a Concept Artist and REALLY want to post my work on Instagram from my desktop. Any workarounds? What version of OS X are you running? I can try and test it out again on my end. Also, the same for Bluestacks, what version are you using of that as well? @andrewprobert:disqus, I’m running an older version of Bluestacks. Same version of OS X. No issues getting to photos. I have seen some users have issue and others have not. Another way you could potentially do this is to upload your files to Dropbox on your computer and then upload them through Instagram on your mobile device if you’re having issues. 2nd time around with bluestacks. There’s no advanced setting under the Setting icon in order to turn off the computer camera. Someone mentioned this a while down in this thread but there wasn’t a reply.Any help would be appreciated. Was actually able to get to Advanced Settings through a tutorial, there’s nothing under Advanced settings to allow you to turn off your computers camera. @chakaatiim:disqus, what part wasn’t working? They stopped supporting Mac a while ago with this software but you can still find an older version out there. Hi Christian. Your video is most helpful. I followed the steps and everything work until the part going into advanced options on Instagram to change the camera feature. Advanced options isn’t an option anymore. Do you have any suggestions of know of anything about this? What version operating system are you running? I tested this the other day with someone on a Mac and it worked just fine for them. Then again, the Mac version hasn’t been updated for a while. I’ve had some people tell me they’ve had issues. Instagram has changed things a lot, so you may need to reach out to Bluestacks to get further clarification. Hi i don’t see an advanced settings option, maybe because its been updated since? Also I don’t have any options when i click ‘camera’ it doesn’t give me the option to chose from gallery, it takes me straight to the editing section on instagram and i only have the options to take a video or picture. Any help? Apparently this does not work in 2016- any new info to be able to access computer’s camera settings with Instagram/Bluestacks? Hello. Thank you for your help with Instagram for my PC. I’m on good until I get to the step to unclick advance features….no setting on my instagram-so I can’t upload a pic from my PC. Bluestack is a great software, but there’s a problem that’s not that easy to overcome – it’s not supported by minor OS like linux mint or fedora etc. My solution was to use Zengram, it’s a web-based service accessible from any device with open file system and a browser. Quite useful I must say, even without considering a large set of other functions offered by the mentioned service. Thanks for the recommendation @suzycutiepie:disqus. Under the dot dot dot, I am not see the advanced setting option to uncheck camera? Can no longer find “Advanced Features” to turn off “use instagram’s advanced camera. Advice please. I’m trying to find the advanced features to turn off the camera. Same problem as other people are facing so I see. If I hot the link, I get an error down below. Please let me know where I can find the solution. Previous Previous post: Facebook Algorithm Change: Stop with the text updates! Next Next post: How to properly perform a Facebook link share in four steps!